Smigiel – a one year swansong? 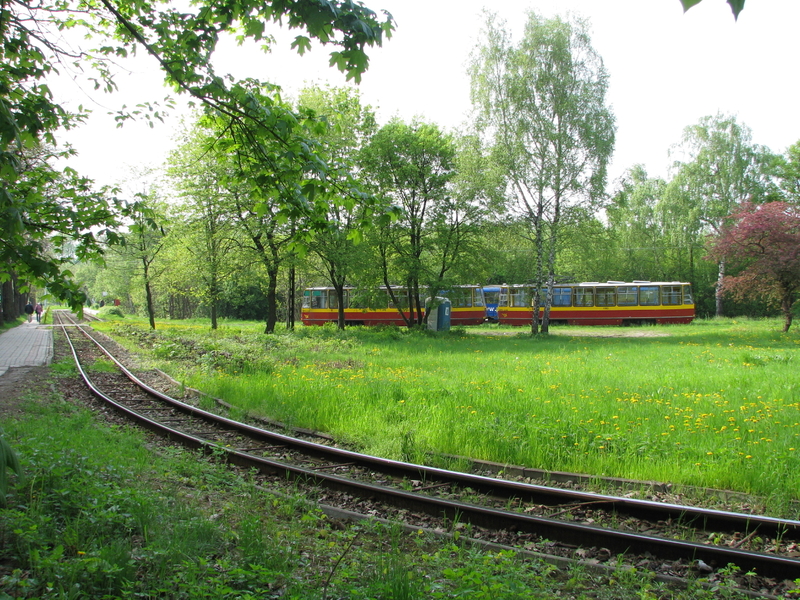 Narrow gauge – standard gauge transporter wagon siding at Stare Bojanowo. Photo U.M. Smigiel. The Smigiel Railway is the last of its kind. Within one lifetime Poland has changed from a country which was covered by a dense network of narrow gauge railways, to a barren wasteland where most of the handful of narrow gauge survivors cling on to a precarious existence only kept alive by tourist trains in the summer. A handful of n.g. lines, all operated by SKPL, still carry freight. Following the closure of the Krosniewice Railway, the busiest of the freight lines is now the Kalisz Railway, now only operational between Opatowek and Zbiersk. The Przeworsk Railway carries the occasional truck of coal to Dynow. The Smigiel line still appears on the PKP Cargo list of freight depots, but its transporter wagons have stood unused since the spring. The Pleszew Railway is busy carrying freight, but on standard gauge rails (the railway is mixed gauge) so it doesn’t count. When it comes to regular public transport passenger workings over the list is even shorter – just Pleszew and Smigiel. So Smigiel, which operates a regular passenger service during school term time and is theoretically still open for freight, really is the last of its kind. However, relations between SKPL and the Mayor of Smigiel are not good, and with the demise of the coal traffic earlier this year it looked as if SKPL would be withdrawing from its operating agreement at the end of the year. Now it looks as if Smigiel will have a final swansong – a contract to carry road stone is being negotiated which should see freight carrying resume in October. 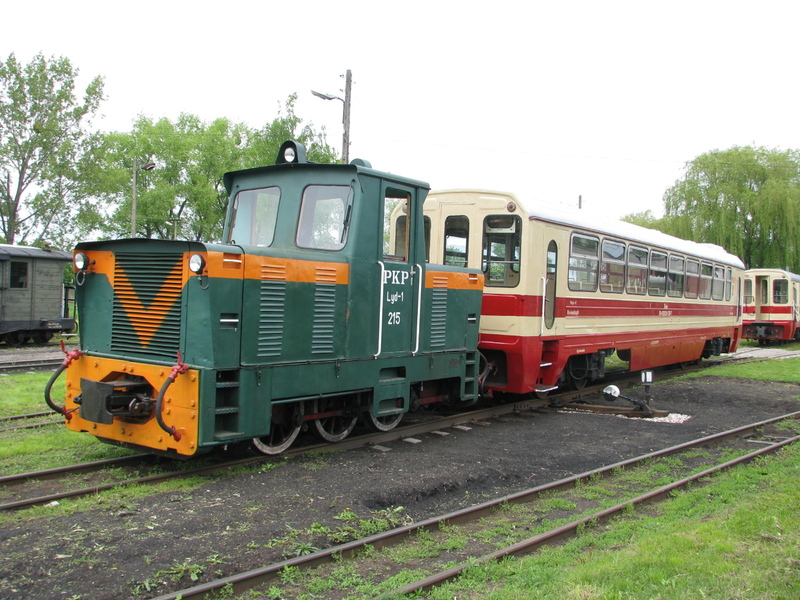 So Smigiel will have its swansong, maintaining for one more year its position as the last narrow gauge railway in Poland to run a regular passenger service and operate freight services. Perhaps BTWT should organise a study tour to witness the last days of the Smigiel Railway as a real working railway and also explore some of Poland’s surviving narrow gauge lines? Perhaps the itinerary should be something along the lines of Robert Hall’s recent journey? Warszawa Zachodnia. Photo Michael Dembinski via W-wa Jeziorki. In December 2009, Michael Dembinski wrote with passion about Warszawa Zachodnia station. Poland’s worst railway station, must be Warszawa Zachodnia. Poland’s Clapham Junction, with trains local, suburban, regional, national and international passing through. W-wa Zachodnia sports a seemingly random collection of platforms, with a complete lack of travel information provided to passengers at platform level. No indicator boards, no timetables. No clocks on the suburban platforms. No one to tell you if you are in the right place, if your train is on time. A little unfair to Clapham Junction which I am very fond of, but the rest of Michael’s sentiments I would wholeheartedly agree with. Why I am linking to a blog entry that was published nearly two years ago? Well the Fact Compiler has gone away on holiday and has posted a snippet of Les vacances de Monsieur Hulot on his blog. Zachodnia is one of the best two stations in Poland (the other is Poznan Glowny) where passengers can play the Monsieur Hulot’s Holiday game. Some English visitors were in Warsaw some two years ago and after missing their train to Moscow from Warszawa Centralna (because it didn’t start from Centralna) they played a good game at Zachodnia and only caught the next train – just! Major highways in Poland. Map by GDDKiA. Translation P2E. On Wednesday 25 August, BTWT posted Journey to Hel showing how holidaymakers were suffering third world conditions in PKP IC trains as a result of Poland’s lop-sided transport policy. The article posed the question whether the pro-road bias had anything to do with the greater opportunities that road building gave those in power to make a little money. As if on cue, two major road building scandals have erupted in the national press. The first of these first appeared in the Rzeczpospolita daily on the same day as our article. At the beginning of 2010, the General Directorate for National Roads and Motorways (GDDKiA) gave a 7.5 million zloty (1.9 million euro) planning contract to Tarnow-based MGGP and Complex Projekt without holding a tender. Malgorzata Grad, the wife of Treasury Minister, Aleksander Grad, was Deputy Chairman of MGGP, one of Poland’s largest surveying and project groups, and is now a partner of company run by Franciszek Grybos, a childhood friend, of the Minister, which operates from the same address as MGGP. When challenged by journalists GDDKiA spokesman, Marcin Hadaj, explained that the award of the contract to MGGP was the only solution as the company help the copyright to the motorway plans. But Hadaj’s explanation only begs the question why a contract with this unusual copyright provision was approved by GDDKiA’s Katowice regional head mgr inz. Krzysztof Raj. 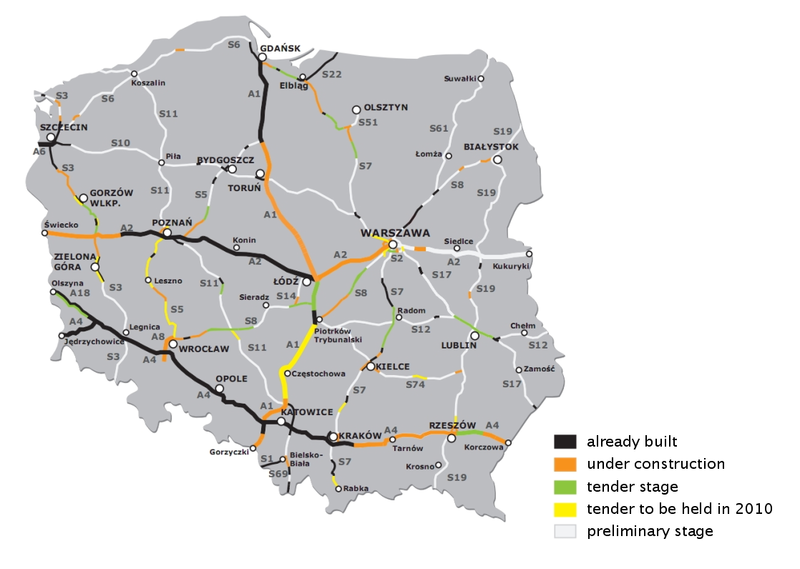 The second scandal broke two days later on Friday 27 August and concerns the building of the A1 motorway which will link Gdansk in the north to Grorzycki in the south. Under the headline Motorway built on sand, the PAP news agency reported allegations that during the day the contractors building the motorway laid a bed of good quality dolomite ballast upon which the tarmac road metal was supposed to be laid. During the night the dolomite was carefully removed, taken away in dozens of trucks and replaced with earth. The dolomite was then reused the following day. Each delivery of ballast was billed as a new delivery. The scam has apparently being going on for several months. Each delivery truck carries 30 tonnes of ballast. With good quality dolomite ballast costing up to 300 PLN per tonne, it is thought that the perpetrators have defrauded the Polish tax payer of millions of zloty. MPK Krakow, the municipal transport operator in Krakow, is celebrating the successful completion of an EU project worth 300 million PLN. 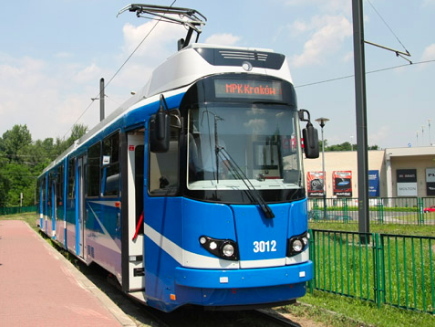 The project, ‘Integrated Public Transport in the Krakow Conurbation’, has helped MPK to build a bus station at Krowodrza Gorka, modernise the track from the Kamienna loop to Krowodrza Gorka, and purchase new trams. The EU conrtribution came from the EU Structural Fund Programme Infrastructure and the Environment. Now a further 185 million PLN project has been signed of which will allow the construction of a new tram line to the roundabout at ul. Grzegorzeckiego Street to Golikowka, with the construction of a 1 km length of a new street, ul. Kuklinski, the rebuilding of ul. Dluga and the purchase of 24 low-floor 32m long air-conditioned ‘Flexicity’ trams from Bombadier. Perhaps MPK Krakow show consider hiring out some of its EU funding specialists to clear up the mess at PKP PLK? While MPK Krakow have exhibited considerable skill in coping with the complex demands of EU project,s their own engineering department have shown considerable skill in creating a new tram from recycled tram components. MPK Krakow and Wiener Linien have been cooperating for many years and Vienna E1 and C3 cars have been running in the city since 2003. In 2009 MPK bought a Vienna E6 motor unit and C6 driving trailer. The cars used to rum on the Vienna semi-metro in a E6+C6+C6+E6 formation. A new low body passenger section to sit between a E6 and a C6 unit was manufactured by Polish bus body company, Autosan S.A. of Sanok. The two ex Vienna vehicles were specially adapted to accept the new articulated section and extensive trials were held in 2009 and 2010. The new vehicle, classed EU8N, proved a great success and was officially presented to the public on 18 June 2010 during the 135 anniversary celebrations of municipal transport in Krakow. MPK Krakow have bought 25 E6 and C6 pairs from which they plan to build 25 EU8N vehicles. People crushed in coaches with no room to move, others travelling in the space between coaches, passengers jammed in toilets, mothers with small children crying because they cannot relieve themselves – reports like these have been coming in daily during the summer holidays. Meanwhile recently refurbished coaches are left to the mercy of vandals in sidings. Why? Because PKP IC is heading for a thumping loss and has been told to cap its deficit and cutting down on trains and coaches is the only way it knows how. Why? Because PKP IC management do not understand the basics of marketing and face track access that are amongst the highest in Europe. Why? Because the half-baked ‘reform’ of PKP makes Poland’s railways expensive to run and inefficient. Why? Because the government – despite its green posturing – is pursuing a pro-road agenda which the rest of Europe has long abandoned. Why? The Poles have a saying, Jeśli nie wiadomo o co chodzi, to chodzi o pieniądze. Which loosely translated means – if something doesn’t seem to make any sense, you can bet someone’s making money out of it. With a hat tip to Podróżny for the link to the video. PORR Polska commence work on Warszawa Centralna. PORR Polska has commenced work on the renovation of Warsaw’s main station, Warszawa Centralna. The first part of the station being worked on is the section of the main hall next to al. Jerozolimska; work on the subway level will start in September starting from north; and work on the platforms will commence in February 2011. The platforms will be renovated one at a time and individually withdrawn from service while their renovation takes place. Warszawa Centralna as a whole will continue to remain open while work takes place though certain local services will be diverted to Warszawa Gdanska. Interestingly PKP’s press release does not give a completion target for the refurbishment, though we understand that the work is supposed to be be ready in time for the UEFA European Football Championship which will take place in Poland and the Ukraine between 20 June and 1 July in 2012. Ever wondered about the funny smell inside Warszawa Centalna station? Ace Warsaw blogger Michael Dembinski has unearthed its source. Anyone who has ever passed through Warsaw’s Dworzec Centralny will have noticed its unique aroma, combination of body odour, urine, excrement, fried food and cheap disinfectant. Until now, I had attributed the stench the fact that most Polish passenger carriages have toilets that flush directly down onto the tracks below, and that these toilets are used while trains stand at the station (despite notices prohibiting this). Go to today’s post Source of Warsaw Central’s Stench Revealed on W-wa Jeziorki for the whole improbable story. Last of its kind, Tr12-25 at Parowozjada 2006 in Rabka Zaryte. Photo BTWT. 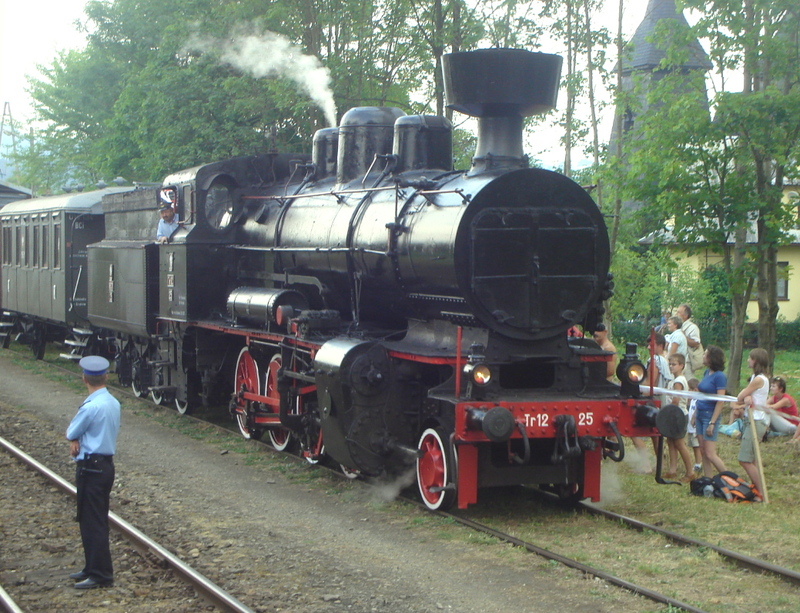 This year’s Parowozjada, the annual steam gala organised by the Cracow division of PKP Cargo, will take place in the Chabowka ‘skansen’ on the weekend of 28 and 29 August. As well as the Chabowka engines, there will be a couple of international guest locos and 4-6-2 Pm36-2 and 2-8-2 Pt47-65 are booked to attend from Wolsztyn. Although all the main events will be taking place within the confines of the depot, there will be plenty of steam specials running to provide excellent photo opportunities for the most avid railway photographer. We understand that tickets will be sold on board these trains on a ‘first come, first served basis’ and that no seat reservations are available. The above programme is liable to change and you are recommended to check the Chabowka website for a complete and up-to-date list of events. PKP InterCity’s new COK in Warsaw. From a photo by PKP. This week’s horror story about a PKP InterCity guard who threw a disabled girl’s wheelchair off a Szczecin – Katowice train illustrates how PKP InterCity bosses seem totally oblivious to the fact that they are running a service company in a highly competitive industry where the way you treat your customers makes a real difference to market share and bottom line. PKP InterCity lost PLN 76.8 mln in 2009, and this year, the deficit is getting worse. InterCity boss, Grzegorz Medza, blames Przewozy Regionalne (Regional Services), which offer cheaper fares on some of the same routes. But in fact the number of passengers carried by PR is tiny compared to the number of passengers lost to long distance buses and motor cars. 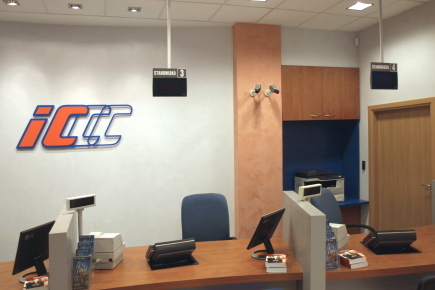 InterCity passengers pay a premium price for their tickets and if InterCity wishes to retain their custom it must offer a premium service. Sadly the opposite often seems to be the case. My mailbox regularly fills up with complaints about how difficult it is to arrange group bookings through InterCity, but it seems that even the tiniest problem is beyond the wit of the organisation to put right. Recently I was due to make a journey by PR osobowy (stopping) train from Lodz to Kutno followed by a dash across country in an InterCity TLK train from Kutno to Poznan and finishing off with another osobowy train from Poznan to Stare Bojanowo. With the ticket office at Lodz Zabieniec closed for refurbishment, I was forced to buy my tickets on board the train. The first problem that occurred was when I attempted to book my through journey through the guard. He could only sell me a ticket for the first part of the journey – from Lodz to Kutno; because InterCity and PR had not agreed a common ticketing policy, the cost of the journey would be the sum of the cost of the three separate journeys. The next problem reared its head as my first osobowy train was delayed in a passing loop some 10 kilometres short of the mainline junction at Kutno. We were due to cross a second osobowy running in the opposite direction, but that train had been delayed waiting for its connection at the Kutno. Any chance of holding my TLK train till we arrive at Kutno? I asked the guard. No chance, he replied, however there’s an InterRegio semi-fast running just behind. I’ll sell you a ticket for that and then you’ll also get a better price for your onward journey from Poznan to Stare Bojanowo It seemed to make sense the total price of my new ticket for a journey from Lodz to Stare Bojanowo via Kutno and Poznan using PR services was about the same as the cost of a TLK ticket for just the segment Kutno to Poznan. I arrived at Kutno in the middle of a rainstorm. As I huddled down the subway to keep dry a train came into the platform. It was my InterCity TLK train which itself had been delayed! I leapt on board cursing the bad information I had been given by the guard of my osobowy. When the ticket collector came to my compartment I launched into my explanation and asked him to issue me with a new ticket for Kutno to Poznan and to endorse my PR ticket as unused on this section. The guard refused to endorse my PR ticket and charged me a 5 zloty penalty for buying my ticket on the train. As soon as I realised what had happened I marched down the corridor, and gave the guard my special 5 minute customer care course which I have carefully crafted for the checkout operators at my local supermarket. This had some effect, 10 minutes I had a brand new ticket and 5 zloty. I promptly spent the latter on a very welcome cup of tea from a lady with a trolley. I now had three tickets for the journey from Kutno to Poznan. Surely, I thought, I’ll now be able to get my refund from the PR ticket office at Poznan? How wrong I was! But I’m getting ahead of my story. As I sipped my tea, one of the ladies in my compartment confided that she now lived in Austria and was on a trip to Poland to visit her relatives. After reading in the papers about passengers being unable to get on board their long distance trains because they were so packed, she decided to leave her children behind with their Austrian grandparents. Her worst customer care experience ever was also with PKP InterCity. A year earlier she had bought tickets for herself and her children at the InterCity ticket office. On board the train, the ticket collector gravely explained that only children who attended schools in Poland were entitled to the 37% discount school children’s ticket; children who attended schools outside Polnd were only entitled to a 33% discount ticket. He could not, he claimed, upgrade her children’s tickets. She would have to buy a new set of tickets and claim back the cost of the original office at InterCity’s ticket office in Warsaw. Arriving in Warsaw she made a beeline to the ticket office and demanded a refund for her unused school children’s tickets. She got her refund minus a hefty administration fee. When she complained she was told that she was lucky that she had not been fined 150 zloty for each of her children who had been travelling on a train without the right ticket! Arriving at Poznan I went straight to the PR information office and explained what had problem. No problem, smiled the attendant, just go the the InterCity Customer Care Office and explain what has happened they’ll endorse your unused ticket and you can then get your money at any ticket window. So I went to the Customer Care Office and waited, and waited… Finally someone was free to talk to me. I can’t endorse your ticket. Only the guard can do that. But he refused. Well, he shouldn’t have. Perhaps you would like to fill in a complaint form? All my words and entreaties had no effect. Sadly I made my way to the platform to wait for my final osobowy. When the guard came round to check my ticket. I thought, At last I am dealing with a PR employee. He will know all about the wicked ways of InterCity. He might be able to advise me on what to do. Who knows, he might even agree to endorse my ticket. I apologised that this might take a long time and launched into my story. But the guard had no time for my tale of woe. He just wanted to see my ticket. We exchanged polite pleasantries. I ventured the opinion that by not listening to customers he was not doing his job. He proffered the view that he couldn’t see any customers and that I had uttered a great calumny and that he was minded to call the police. I went back to my seat sadder and wiser. Perhaps I should have threatened to call the police when the InterCity guard had refused to endorse my ticket? Maybe there is a special squad of police who keep up to date with the ever changing regulations on Polish railways and who are the ultimate arbiters in all such disputes? My rude guard not withstanding I made a mental note to avoid InterCity operated trains in future and to travel on Poland’s railways in PR’s InterRegio and osobowy trains as much as possible. After all, my PR guard was probably terrified that if I had managed to explain my problem to him, he would have been obliged to try to solve it, and to do so was way beyond any authority granted to him. Ty2-911 and reenactor at Skierniewice depot, 12 August 2010. From a photograph by Jerzy Dabrowski. Photo © Oko na Swiat Photo agency. It’s not every day that one can see a steam engine in steam at Skierniewice so, following a tip off, (there was nothing about this ‘happening’ on the PSMK website) an early evening pilgrimage was duly made. I must admit a certain fondness for travelling across Poland by car on roads ‘off the beaten track’ and some of the route from Janow (on the Rogow n.g. line) and Skierniewice lies along a beautiful tree-lined avenue that runs across gently undulating hills. When I reached Skierniewice, there was already a long line of cars parked on the road besides the depot, but I managed to shunt into a slot just vacated by the straz mieska (municipal police). Sunday 15 August is the 90 anniversary of the Battle of Warsaw – a defining event in Poland’s post WW I history. But I had come to Skierniewice to witness a different kind of battle; I wanted to see how the PSMK ran a themed open day and whether the association was using the occasion to advance its own long-term objectives. The first surprise was at the gatehouse where in days gone by passes and temporary permits were checked before allowing entry into the MPD. Entry was free! There was a donation tin, but its tiny slot precluded the entry of notes. Every visitor received a beautifully printed Edmondson card ticket. Inside the depot grounds, there were several hundred people milling around the exhibits. The association had brought out some of its own large exhibits from their customary home inside the roundhouse including the 1913 Wittfeld battery railcar and 2-8-2T Tkt48-39, but the biggest crowds milled around Ty2-911 which had come with a vintage train of 4 wheeled passenger carriages from Chabowka. By this time the ‘Kriegslok’ was only in light steam, but it was still a ‘live’ steam engine and ,with its footplate open to visitors, it was undoubtedly the star attraction of the day. Reenactors from the GRH Radosław and PSRH X DOK societies wearing army uniforms of the 1920s reminded us of the occasion when volunteers from all over Poland travelled to Warsaw to defend the newly independent country against Lenin’s army. However, I had a different ‘target’ in my sights; the President of Skierniewice hove into view by the newly repaired turntable. One of her assistants was giving out apples individually packed in pretty boxes; although at first glance it was difficult to see whether the purpose of the exercise was to promote the town or encourage voters at the forthcoming local elections. Madame President, I began, I have come all the way from London to witness today’s proceedings. Let me congratulate you on having such a heritage pearl in Skierniewice. Thank you. she fluttered her eyelids modestly, but the congratulations should go to the railway association. 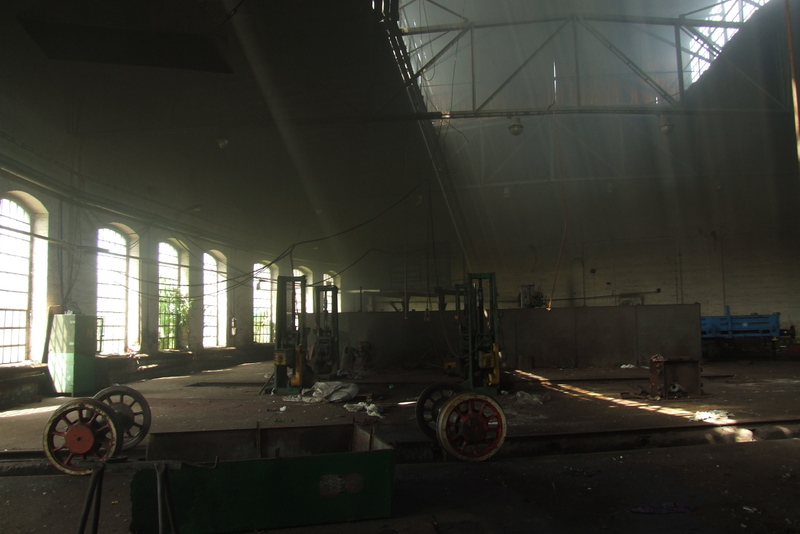 I hope, I continued pointing at the broken skylights in the roundhouse roof, that some formula may be found – maybe by means of an EU-funded project – to help the Society restore these historic buildings. Realising that the conversation was moving to dangerous territory one of the President’s minders steered her away from the dangerous anarchist who had dared to voice such heretical views. Meanwhile another official coldly pointed out that the Town Council could not help restore the MPD buildings because they did not belong to the Council, but the Society! Paper trail or public consultation? Yesterday (11.08.2010) the Ministry of Infrastructure published a consultation document entitled Konsultacje społeczne – Program działan dla transportu kolejowego do roku 2015 (Public consultation – programme of activities for railway transport until the year 2015). The document is, I suspect, the Ministry’s response to the criticisms recent report by the Najwysza Izba Kontrolli (Public Audit Office) which castigated not only the PKP group, but also the Ministry, for mismanaging Poland’s railways. While, I am sure that the document contains many reassuring words about increasing the role played by rail in Poland’s transport mix, I fear that it may be less expansive on how such a thing is to be achieved. Does it reveal any commitment by the government to get road haulage companies to pay a greater contribution to the maintenance of the road infrastructure? Is there any undertaking to reduce Poland’s high rail track access charges to levels more commensurate to those which obtain in other EU countries? Is there any provision to increase the funding available to maintain and improve Poland’s collapsing railway infrastructure? Is there any intention to facilitate the transfer of unwanted branch lines to local authorities or other operators who are willing to maintain them for railway transport? Is there any plan to improve the management of Poland’s railway companies? Is there any recognition that excessive fragmentation of Poland’s railways has increased costs? 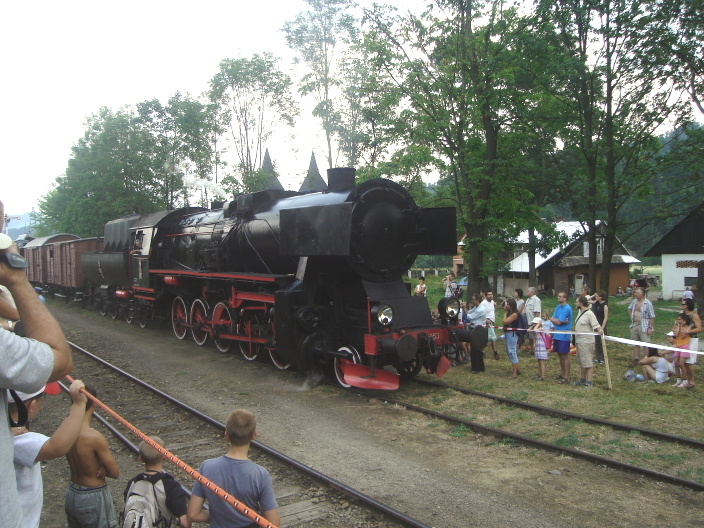 Ty2-953 hauling Chabowka’s vintage goods train at Raba Zaryte on 2 August 2006 at the Parowozjada steam gala. Photo BTWT. There will be a rare occasion to see a working Ty2 at Skierniewice tomorrow. The locomotive and vintage train from Chabowka will be electric hauled from just outside Krakow to Piotrkow Trybunalski. If all goes well the train will then be steam-hauled from Piotrkow to Skierniewice. The train is due to depart Piotrkow about 12:00 (this time is very approximate) and arrive at Skierniewice at 14:45. The depot itself (with its recently refurbished turntable) will be open to the public from 18:15 to 20:00 when there will be a film show. 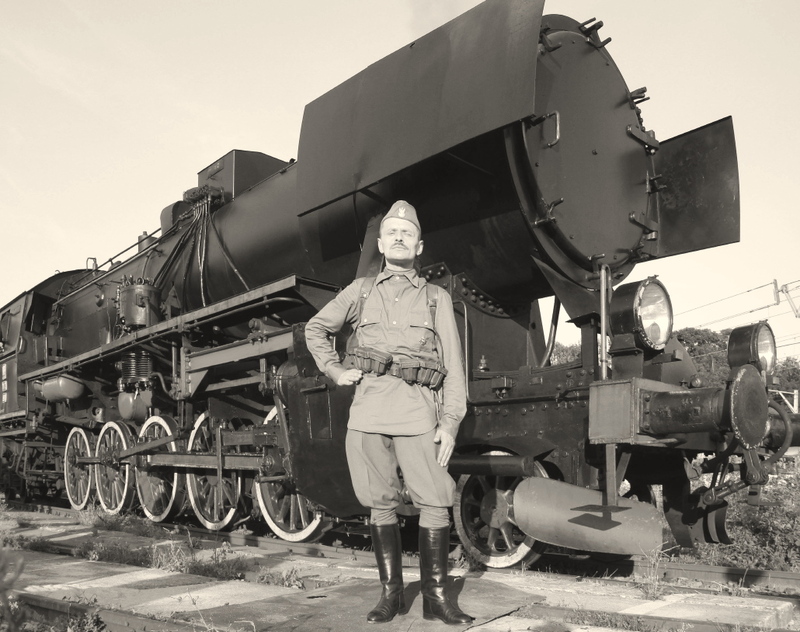 The locomotive, train and actors dressed up as Polish volunteer soldiers will be commemorating the 90th anniversary of the Battle of Warsaw – a key event in securing – for 20 years at least – Poland’s newly found independence. So if you live near Warsaw, take the day of work. Tell SWMBO that you are taking the children mushroom picking and secure a good vantage point along the line between Piotrkow and the junction at Koluszki. After the train passes you will have ample time to explore the woods and hunt for mushrooms, before taking the kids for a Pizza and moving on to Skierniewice shed. After photographing Ty2-911 on the Skierniewice, you may have to take the little horrors home, but if they are older they may well be interested in staying for the film show Polonia Restituta which will be shown at 20:00hrs in the depot. It you just cannot get to Skierniewice,you’ll have a chance to see the loco at the warsaw Railway Museum on Friday afternoon and Saturday morning. And yes I know that Ty2s were built from 1942 onwards and that the Battle of Warsaw was faught in 1920. 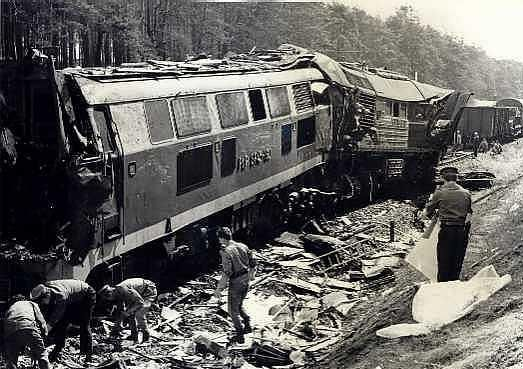 It appears that the locomotive that was originally booked for the leading role in the commemoration events – Chabowka based Ol12-7 had failed at the last minute. Two standard gauge wagons on three transporters returning from Zbiersk to Opatowek. Photo Tomasz Jankowski, SKPL. For those who relish above all else, genuine commercial railway operation, the jewel in the Polish narrow gauge’s crown nowadays has to be SKPL’s 24 km Opatowek – Zbiersk 750mm line – freight-only, but Poland’s one remaining narrow-gauge railway which handles a worthwhile and dependable amount of revenue-earning freight. This takes the form of stone, fertilizer, and a certain amount of timber. 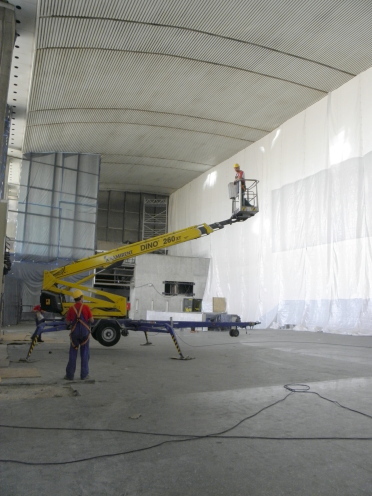 Workings usually take place several times a week, but on a as required basis – it helps enormously, to have on hand a knowledgeable contact, in touch with the nerve-centre of operations at Zbiersk. Dyspozytor performed this office, and ascertained that a freight train would be running on the morning of Monday July 19, departing from Zbiersk at 08:00 for the standard gauge interchange at Opatowek on the Warsaw – Lodz – Wroclaw main line. We considered staying overnight at Russow near Zbiersk, but in the end a 06:00 departure by car from Lodz was decided upon, to cover the 90-odd km west to Zbiersk in good time. In part, a beeline was taken over country roads, with Dyspozytor driving and me navigating – despite a couple of minor mess-ups, we got to Zbiersk station only a couple of minutes after 08:00; to discover that due to some minor repair work on the locomotive, our departure would now take place at 08:30, at the earliest. The SKPL staff made us welcome and plied us with tea, while we waited; and we had the chance of a quick look around the locoshed and workshops, including the heartening sight of transporter trucks undergoing maintenance – an indication of freight action on this line continuing for a while yet. Our train departure was ultimately at 08:42. It was a fairly minimalist freight working, but indubitably a genuine one: B-B Lxd2-287 hauling a transporter truck carrying one empty standard-gauge four-wheeled van, which had arrived the previous Friday loaded with fertiliser. Dyspozytor had arranged for us to travel in the loco’s cab, with the driver and second-man – four in the cab was OK any more would probably have been rather a squeeze. The 24km to Opatowek was covered in about an hour and a quarter. The track seemed fairly overgrown, but was in better-than-dreadful condition. There were many ungated crossings; the most momentous being over the direct Kalisz – Turek road. All of these were negotiated cautiously, with a great deal of horn-blowing from the loco. This particular Lxd2 anyway, had two horns, one on each side of the cab – one shrill, the other deep. At Zelazkow, the junction for the fork of the line to Russow and formerly, Kalisz, the branch was still there and visible, diverging; but very shortly after the junction, vanishing into thick vegetation. Dyspozytor said nostalgicaly that he had organised a special train from Russow to Rurek which ran along this short spur some three years earlier. These days nothing less than a tank would have cut through the jungle. Onward to Opatowek, where the standard gauge wagon was run off the transporter and on to track of its own gauge. (We were able to render a little help in this operation). SKPL has a tiny standard gauge diesel shunter stationed at Opatowek, which our driver drove to pull the wagon clear from the actual interchange point. At about 10:30, we headed off back for Zbiersk, with the loco hauling the empty transporter truck which had conveyed the wagon. We gathered that the transporter had some minor fault which needed attending to in the Zbiersk workshops. Back to Zbiersk at 11:49 – and that was it, for the railway’s action for the day. Farewells made to the staff, and then we were on our way. Dyspozytor and I arranged to reunite at Smigiel in a couple of days time for doings of possibly some significance. In the meantime, I planned a few days exploring to the west and north. We drove to Konin, on the Warsaw – Poznan main line, whence I would travel by train westwards. The first part of the drive was plotted to encompass a couple of crossings over the narrow gauge line’s section Zbiersk – Turek, which had a freight service run by SKPL. This had operated until three years or so ago, but fell victim to the sadly frequent situation in Poland nowadays, of local councils having no interest in their local narrow gauge railway other than extracting money from it via rates and other local charges. SKPL’s chairman basically told the local councils, We’re not playing, and suspended workings on the section Zbiersk – Turek. The track is still there, but overgrown to the point of becoming invisible… having checked out part of this line we drove to Konin. Hetre we parted, I boarded a train running west to Rzepin. We agreed to meet up at Stare Bojanowo, the standard-gauge railhead for the Smigiel narrow gauge railway, at 15:42, the arrival time of my local from Poznan, on the day after next. Lyd1-215 and immaculately restored Romanian trailer at Rogow, 15 May 2005. Photo BTWT. The item on the menu for Sunday 18 July was something which I had set my heart on months earlier – the Fundacja Polskich Kolei Waskotorowych (Polish Narrow Gauge Railway Foundation) preserved 750mm gauge line at Rogow. A line lauded as probably the country’s best achievement of recreating the atmosphere of the narrow gauge in PKP days with the exception of steam – the line has a pair of Px48, but not in working order. That would seem fair enough: dieselisation of PKP’s narrow gauge set in quite early, with a fair number of narrow gauge railways going 100% diesel as at the early 1980s, or before. This was a big reason for my never hitherto having been to this line: it went all-diesel quite early, and my overriding reason for visiting Poland up to the early 1990s, was to see active steam. Though a narrow-gauge devotee, I skipped many narrow-gauge lines in those times, because of their steamlessness. The line’s west-to-east 49 km, Rogow to Biala Rawska, is all still in situ, and the preservation undertaking is entitled to operate on all of it. It does so, on a very few days of the year. Most of the time, the line operates on summer Sundays only, over the 17 km from Rogow east to Gluchow. Two return runs per day: the earlier just 8 km out to Jezow and back, the later a return working all the way to Gluchow. We opted for the 13:15 Gluchow return train. Rogow was reached, by car, in just nice time for departure of this working: a Bxhpi 1Aw in proper green livery, two semi-open bogie coaches rebuilt for tourists from coal wagons, and a bogie brankard guard’s utility van – this latter seemingly a standard component of all 750mm gauge tourist trains. Motive power was a tiny jackshaft-drive 0-6-0D, Lyd1-215 –of a class which I had met in the past on the 750mm system at Elk, where for many years they handled all traffic. Wanting to feel as authentic as possible, we took our places in the1Aw . The train set out, crossing on the ungated levelcrossing a little way out of Rogow across the trunk road eastwards from Lodz to Rawa Mazowiecka. We ran slowly, but steadily (Dyspozytor commented that the track had been improved) through pleasant tranquil gently undulating countryside. We passed the intermediate stations at Jezow and Bialynin, to arrive at Gluchow some 35 – 40 minutes after leaving Rogow. Church-bash concluded, we were left free to explore the village, or make our way back to the station. The organised fun was not over, however. Dyspozytor, who had not taken part in the church trip, had during my absence kitted us out for the next phase of activities – which came about after we had travelled 9 km back westward, as far as Jezow. The train made a prolonged stop there, and on a green tree-ringed patch, with benches, close by the station, a bonfire was lit. Dyspozytor explained that this was a particularly Polish thing – grilling sausages on sticks over the bonfire. (At the Gluchow grocer’s-and-general shop, he had purchased a couple of sausages for the purpose, and a few bottles of beer.) Very many Poles of all ages are / have been in their youth, involved with the Scout movement or its other-ideology alternatives; the ‘campfire / sausage’ ritual is one with many nostalgic associations from when folk were young, and it’s a something that Poles love doing. On both the other narrow gauge tourist trains on which I travelled during this holiday, sausage-grilling over a campfire featured at some stage of the proceedings. We duly grilled our sausages and ate them as we quaffed our beer. I wonder whether this would this work as a gimmick on certain minor British preserved lines? Finally the ‘barbie’ was over, and the train returned to Rogow, getting there abouty 16:30. The line has an indoor museum at Rogow, which was unfortunately closed by the time of our return. For whatever reasons – some, probably not within their control – Polish heritage-railway undertakings do not always have their act together as well as they could. As well as the two Px48 mentioned earlier, there is at and around the Rogow narrow-gauge station, an assortment of motive power and rolling stock: including several class Lxd2 B-B locos (the loco type most commonly encountered now, on the Polish narrow gauge), a couple of elderly railcars, assorted freight wagons, and a few diminutive standard-gauge diesel shunters. A fairly quick look round this array; time then to head back to Lodz, for a necessary early start to Zbiersk and the Kalisz narrow gauge railway on the morrow. Banks of linefinders – part of the Siemens built historic telephone exchange in the railway museum at Skierniewice. Photo Pawel Mieroslawski. Sat. 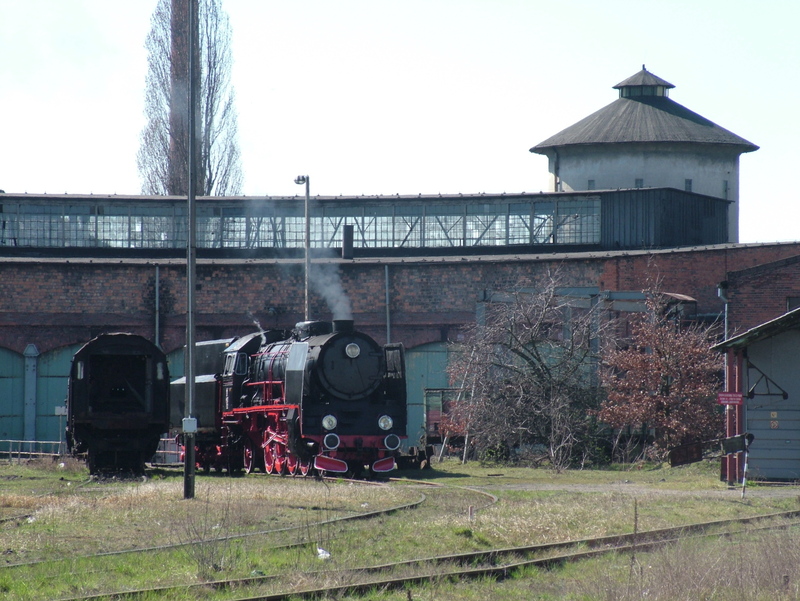 17th was slated for a visit to the Polskie Stowarszyszenie Milosnikow Kolei (Polish Railway Enthusiasts’ Society) museum based on the former locomotive depot at Skierniewice, 50 km north-east of Lodz on the Warsaw – Czestochowa – Upper Silesia main line. I met up again with Dyspozytor and we caught a brand-new EMU built by PESA at Bydgoszcz, comprising the 10:54 Tanie Linie Kolejowe semi-fast to Warsaw (TLK is the PKP InterCity brand for trains that are not categorised as being in one of their ‘fast’ categories such as IC or EIC.) Dyspozytor was scathing that, after a line upgrade costing billions of zloty, the brand new rolling stock was being throttled down to a maximum speed of 130 km/h because Polish railway regulations demanded two people in the cab for trains travelling at higher speeds. Dyspozytor directed me to some uncomfortable looking seats near the toilets. When I queried this, he explained that the normal seats, while stylishly designed, had never been ergonomically tested and were uniformly loathed by train crews and regular passengers alike. Soon we were bowling along the newly relaid track. Though our maximum speed was only 80 mph, it seemed much faster. Polish continuously welded rail is much ‘bumpier’ than its British equivalent. There was a long line of cars waiting for us to pass at the level crossing across the Lodz – Rawa Mazowiecka road and soon Dyspozytor was pointing out the headquarters of the Fundacja Polskich Kolei Waskotorowych (Polish Narrow Gauge Railway Foundation) at Rogow, which was to be our destination the following day. While the new rolling stock may be uncomfortable to sit in, it does have powerful air conditioning, and I had not realised how hot it was outside until a blast of heat hit us as we exited the train and started our trek across the footbridge and then towards the shed. The Skierniewice museum is open to the public on the first Saturday of the month in summer, but Dyspozytor had worked his magic and soon we were being welcomed by Pawel Mieroslawski, the chairman of the PSMK. Skierniewice museum is an incredible treasure-house of preserved motive power and rolling stock, which deserves to be much better known among British enthusiasts. I have included a link to the rolling stock catalogue on the Society’s webpages, so here is a short list of what were to me, its highlights. On display in the open, on the periphery of the indoors collection – 2-6-2T OKl27-10, 2-10-0 Ty51-1, 2-6-2 Ol49-4 – and of course the astounding sectioned Prussian S6 4-4-0. Indoors in the former locoshed, were more marvels. Ty2-1407 is the arguably last steam loco built in Poland. Basically a Ty2 2-10-0 Kriegslok, it was assembled in 1964, from the parts of cannibalised locos, by ZNKT Poznan for experiments in the mid-1960s in heavy oil-burning. A totally new concept for me, I had had no notion that oil-burning was ever part of the PKP scene, with Poland having such enormous coal reserves. Mr Mieroslwaski told us that in the 1960s thick oil waste from the refineries at Plock, was tested as a possible loco fuel, and some 350 Kriegsloks were adapted to burn it. Also there was a time when only oil burning steam locos were permitted on the branch along the Hel spit, in order to minimise the risk of fire in the woods which held the sand dunes together. Among the society’s collection of vintage carriages I found what were for me two absolute pearls: standing on a wagon was a 600mm gauge ex-German WW I 0-8-0 Brigadelok, obtained from Lesmierz sugar factory; there was also an utterly marvellous Wittfeld battery-electric railcar, built in 1913 and operated by PKP till 1957 from their Malbork sub-depot. Mr Mieroslawski has in Skierniewice, not only the ultimate ‘train set’ but also an impressive collection of smaller exhibits. 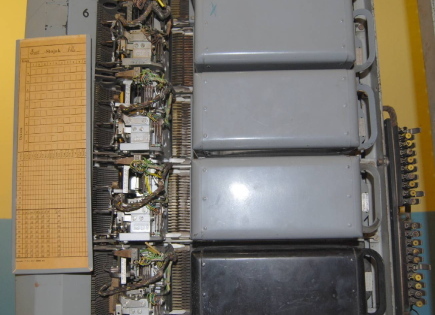 His pride and enjoy is a Siemens telephone exchange of a type that was installed by the Germans during WWII on all the railway lines under their control and which post-1945 became the de facto standard on Polish railways. The exchange has been restored to working order by two members of the Society and is – we were given to understand – the only such installation still in working order. After our tour of the shed and its exhibits Mr Mieroslawski took us around to the Society’s mess room and pulled out a couple of cold beers from the fridge. We discussed some of the problems that Polish railways societies laboured under such as the poor support from local authorities and no clear mechanism to give volunteer-run societies access to EU funds. The PSMK were lucky, in the heady days during the transition from Communism they were promised the freehold of the Skierniewice shed, and after 10 years of meetings and pen pushing, the Society finally acquired the freehold of the site. This gives the PSMK a considerable advantage over other societies who operate under licence from their local authority and whose use of a particular shed or railway line can be arbitrarily terminated at the drop of a hat. Skierniewice Railway Station. Photo Tomasso. We returned to the railway station. There was time to admire the beautifully restored station buildings, a refreshing contrast to what I had seen elsewhere, we grabbed a couple of ices at the smart café inside and caught the 16:15 to Koluszki. I was supposed catch a 17:08 to Tomaszow Mazowiecki at Koluszki. I was impressed that although our train was late the Tomaszow train was held at the junction to make the connection. In fact, the train was also held for a connecting TLK train run by Intercity – an impressive example of cooperation between the two operators. At the end of the erstwhile Piotrkow narrow gauge railway there is an attractive artificial lake that was created in the 1970s by damming the River Pilica. Although I am no sailor, I was to spend an enjoyable couple of hours cooling off in the early evening sailing on the lake. Diesel bus masquerading as a tram at pl. Wonosci in Lodz. Photo Hubar. The third part of Robert Hall’s return trip to Poland. Dyspozytor had drawn up a feast of railed-transport-interest things that I should be doing whilst based in Lodz. Inevitably there were more things to do on his list than I had time available. For a start I made only a fleeting acquaintance with Lodz’s metre-gauge tram system – a 217 km network, that includes Europe’s longest interurban line – from Pabianice to Ozorkow a distance of 44 km. On a whim, I asked how long it would take to cover the whole network and received the answer of no less than three days. However, I reckon that if one cut out all the unnecessary frills and just rode the trams non-stop one would be able to emulate the achievements of the famous route bashers who could cover the whole the London Underground network in one day. Friday July 16th got off to a bad start, Dyspozytor had offered to join me for some of my explorations and a run on tram line 46 to Ozorkow had been pencilled in as the major attraction for the day. Before we started I press-ganged him into helping me with a minor money-changing problem. I had invested in a pile of travellers cheques when my original journey included a Lithuanian leg. But by now I had decided to extend my stay in Poland and dispense with Lithuania, so the travellers cheques had to be exchanged into zloty. It was scorchingly hot. A Kafkaesque episode followed as we shuttled up and down Lodz’s al. Tadeusza Kosciuszki visiting one bank after another; in all of them we received the same answer. Unfortunately we no longer exchange travellers cheques, but why don’t you try bank so-and-so just a few minutes up (or down) the road. Soon we were both wilting. I was all for packing in and changing the travellers cheques back into pounds again in England, but by now Dyspozytor was treating the assignment as a personal challenge and nothing would deflect him from the task. We entered bank number four. I could see from the body language of the lady behind the counter that Dyspozytor was getting the same reply as before. He interrupted the lady’s explanation’s and launched into a stream of rapid Polish… his words seemed to have some effect, a younger lady who appeared to have some authority appeared from nowhere and said a few words, the mood changed and I was given a form to fill in. A minor hiatus followed when I couldn’t find the receipt that I was given when I bought the cheques, but all came right in the end and after about three quarters of an hour I was clutching a bundle of hundred zloty notes. What on earth did you say to the woman? I asked Dyspozytor. I explained that you were a travel writer from Britain and that we had been shuttled from bank to bank and that at the last bank that we had visited – a subsidiary branch of the bank we were now at – we were told to come here. I was soon to learn that Dyspozytor’s way of getting things done in Poland is not so much to be ‘economical with the truth’ but rather to stretch it to the maximum extent possible. The nonsense of the morning had cost us several hours and left us both hot and bothered. We walked through the baking sunshine to ul Piotrkowska and ordered a couple of large beers to be consumed in a booth set up in the road. Here Dypozytor told me that Lodz’s textile industry had developed along ul. Piotrkowska. The first textile settlement was set up here as early as 1821, the various tasks necessary to produce cloth – spinning, weaving, bleaching and dyeing – being performed in home workshops. It was also on ul. Piotrkowska that the first stationary steam engine in Congress Poland was put to work – in 1839 in the Biala Fabryka (White Factory) of Ludwik Geyer. However, the real architect of today’s Lodz was Karl Scheibler, who adopted Lodz as his home town, built his first cotton mill in 1855 and gradually built up his industrial empire to become the ‘cotton king’ of Congress Poland. Dyspozytor explained that Scheibler was the driving force behind many of the developments in the city including Lodz Fabryczna railway station, while his son Karol Scheibler jr. was involved in the development of the tramway system. A strange vehicle looking like a vintage tram hove into view. Dyspozytor explained that the city’s principal north – south tram services used to run along ul. Piotrkowska, but were diverted along ul. Tadeusza Kosciuszki (running some 100 metres to the West) when Piotrkowska was pedestrianised. However, the ‘pedestrianisation’ does not seem to apply to the owners of large expensive cars with tinted windows and most pedestrians keep safe by staying on the pavement. Piotrkowska is the city’s longest street and soon after the trams were diverted the need for a replacement public transport service became apparent. The city’s mayor came up with the wheeze of running a diesel bus dressed up as vintage tram to provide the service. Dyspozytor pointed out how the city was destroying its genuine heritage and replacing it with a ‘Disneyland’ imitation. Pastoral view – the loop at Stoki. Photo BTWT. A couple of beers later we were sufficiently refreshed to return to ul Kosciuszki a street which offered little shelter from the sun. (The street had been widened in communist times by demolishing all the buildings along one side.) We waited till a Düwag GT8 tram on service 46 hove into view. Our plans were to explore part of the Lodz’s longest tram route travelling to some 25 odd kilometres to Ozorkow. But it was not to be. The tram driver made an announcement and all the passengers got off at the next stop. Dyspozytor spoke to the driver – a mishap somewhere to the north of us meant no trams could run to Ozorkow for an unspecified period of time. We were allowed to stay on as the tram diverted to pl. Wolnosci to perform a ‘U’ turn. What to do now? An elderly articulated tram working service No 43 hove into view. The service comprises Lodz’s other inter-urban line running East – West and normally runs from Lodz to Lutomiersk, but due to road works the central section was being run by replacement buses. We were to return to service No 43 another day, but I am running ahead of my story. Our tram was running to its eastern terminus at Stoki, with a short stretch at its furthest end, of single-line running. Our driver on this run turned out to be a tram-buff, doing his dream job. We stayed on board as he went round the loop at Stocki and enjoyed a copious conversation about sundry tram matters during the long layover. Przewozy Regionalne railbus at Miedzyrzecz station owned by Lubusz province. The second part of Robert Hall’s return trip to Poland after a break of 16 years. My journey would now take me over some of the northern reaches of the Magistrala Weglowa (Coal Trunk Line), opened in the 1930s to link the Upper Silesia mining and industrial area with Poland’s then only port at Gdynia. Some of the route between Gdynia and Koscierzyna was 1930s new build, other sections made use of the pre-World War 1 Prussian State Railways network. An hour and a quarter’s run through pleasant gentle hills brought us to Koscierzyna, and a neat connection there with single-unit SA 106-104, representing the 15:24 departure southward. This vehicle carried the markings of Kujawsko-Pomorskie province, whose local rail passenger services are at present operated by Arriva. As we set off, my attention was unfortunately distracted from Koscierzyna railway museum’s steam locos outside the MMPD by an altercation with the railmotor’s guard. It appears that the Polrailpass no longer covers all of Poland’s passenger services but only those operated by PKP Intercity and other PKP subsidiaries. At first we headed due south along a Magistala Weglowa section opened in 1930, called at a couple of stations including Olpuch, then at Bak branched off south-westward on a line which was also new post-WW1. A pause of some length at Czersk, where connection is made with the Pila – Tczew cross-country route (once Prussia’s main line between Berlin, and Gdansk and Kaliningrad (formerly Konigsberg). As we waited for the connecting train I saw a loco-hauled train of single-deck stock, and a modern railmotor. At last, SA 106 moved on, to Szlachta junction where I was to change, and thence further south – though whether to Wierzchucin or right through to Bydgoszcz, I was unable to determine. The pleasure of leisurely railmotor journeys over a quite intricate system of rural lines was marred for me by one big difference from my 1994 visit – all these country lines now appear to be devoid of freight services. Every station at which we called that afternoon, sported a grass-grown, disused goods yard – big or small according to the magnitude of the place concerned – with not a single goods wagon in revenue-earning service. I had observed the same on the Hel branch the previous day. Sixteen years previously, although very many lines had by then lost their passenger services, plentiful local freight action had been in evidence. I find rural railways carrying no freight at all, and seeing no use other than by local passenger services, intensely saddening. In the Beeching era in Britain, some railway enthusiasts expressed the sentiment that they would rather see lines closed, than the trains on them running empty. My journeys in Poland this year bred similar feelings. My gut-reaction was that these lines were in a condition of death-in-life, hanging on by a thin and rather ludicrous thread, and that I would prefer to see the railway administration put an end to the farce, sweep the whole thing away, and do an honest job of ripping the tracks up and ‘having done’. I admit that this is an emotional, illogical and unfair reaction. All the services on which I travelled that afternoon, had a reasonable number of passengers. In fact, from Gdynia to Olpuch, the railmotors were positively crowded, thanks to a large contingent of Scouts-and-Guides, who disembarked at the latter point. The lines are seeing some use, but in a context which put me of wanting to undertake much further standard-gauge-branch-exploration in the days ahead. One of the two saddest sights for me this year – both for the same basic reason – was the station at Szlachta, where I had an hour’s wait between workings. Szlachta was once a four-way junction, today three of the original four lines still meet here. Szlachta is a spacious station with four platforms and five platform roads. It has a large goods yard, now weed-grown and utterly deserted. There was plenty of grass growing over the passenger tracks, too. All this is protected by an elaborate array of semaphore signals, which are still solemnly operated for the passenger workings. The station building is decaying, with no public access except to the neglected waiting room. A notice on the former booking-office window stated, if I interpreted it correctly, that from a date in 2009, tickets would no longer be issued at Szlachta station; all ticket business to be transacted on-train. At the time of my visit, Szlachta still had a stationmistress; there for operational matters – dealings with passengers would appear to be no longer part of her remit. I found the scene most horridly depressing and as my hour in the grave-like quiet of Szlachta junction wore on, disquieting fantasies began to set in. Was I to be marooned forever in this doleful spot? Perhaps my departed SA 106-104 was the last service ever to call here? The sight of a double-unit SA 134 coming into view from the east – the 16:36 ex Laskowice Pomorskie to Szlachta – to become the 17:39 return working. This working (again, operated by Arriva) waited for a while beyond its scheduled departure time, for a late-running railmotor to pop-in-and-out-again on a northbound counterpart working of my 15:24 ex Koscierzyna. The other truly heartbreaking sight was Miedzyrzecz station, a few days later – de-staffed and seemingly deserted, all in very dilapidated physical condition. There was a big overgrown and totally empty goods yard. The only activity on rails was one just-arrived railmotor terminating there. A painful contrast to how things were at Miedzyrzecz on my isit there in 1980. The place was then a busy country junction, a focal point of an intricate net of branch lines, with a loco shed whose inhabitants – chiefly class TKt48 2-8-2Ts – worked those routes. Almost everything was steam, with frequent comings and goings. There was plenty of freight action. There were staff everywhere. Everything ran quite smartly, though in the rather dispirited fashion which was the norm in Communist days. The scene thirty years later, was a most wretched come-down. As regards scenery, Szlachta to Laskowice Pom. was a delectable run of some 40 km through gently idyllic scenery, often traversing thick mainly-conifer woodland, and calling at a succession of sweet little towns. What a superb preserved steam line this could make, if such matters could be arranged in Poland, as they are in Britain. My aversion to dead railways, with nothing left except meagre railmotor services, was so acute that I decided against my original plan of travelling on yet another branch – the line from Laskowice Pom. to Grudziadz. The idea had been to stay overnight at Grudziadz, sample its metre-gauge trams on the morrow, before proceeding southwards on the secondary line which serves the town. I felt, though, that I had had enough of moribund branch lines. so I baled out at Laskowice Pom. on the Gdansk – Bydgoszcz electric old main line. An opportune southbound local emu showed up quite soon, and delivered me to Bydgoszcz at a not too late hour. Bydgoszcz was another place that I had last visited in 1980. On exiting from the city’s Glowny Station, I was concerned to see tram tracks in the cobbles, but no masts nor wires. Had the city’s metre-gauge tram system been axed. In fact, the trams are still busily functioning, but the branch that ran right to the main station, has been axed. Next day with a morning to kill in Bydgoszcz – a nice enough city, but not prime tourist-bait – a tram ride was duly had, choosing a good long route from the centre, out to start of countryside on city’s eastern edge. Then a post-lunchtime departure on a Gdynia – Katowice through express, to reach Lodz early in the evening. I kept a sharp lookout on the run southward, for traces of the ill-fated Kujawy 750mm gauge system, but saw nothing – the tracks, were too overgrown to pick out in passing.